Covering basic theory, new research, and intersections with adjacent fields, this is the first comprehensive reference work on cognitive control – our ability to use internal goals to guide thought and behavior. Tobias Egner is Associate Professor of Psychology and Neuroscience and Director of Graduate Studies in the Center for Cognitive Neuroscience at Duke University, USA. Originally from Berlin, Germany, he received his Ph.D. in Cognitive Neuroscience from the University of London in 2002 and was awarded postdoctoral research fellowships at Columbia University and Northwestern University prior to joining the faculty at Duke in 2009. He has authored dozens of influential research and theory papers on the psychological and neural mechanisms of cognitive control. "This book has everything one could ask for from a handbook on cognitive control. First, the handbook is eminently comprehensive and covers fundamental concepts and hypotheses, as well as a breadth of cognitive operations including working memory, conflict resolution, inhibitory control, performance monitoring, memory encoding and retrieval, and reward and emotion. The text addresses cognitive and neuroscience theories and data, changes in cognitive control mechanisms during healthy development, and neuro-psychiatric disorders. Second, the chapters were written by some of the best scientists in each cognitive control domain including renowned senior scientists and young stars who represent the future of this discipline. This book is a must-have reference for scientists and professionals interested in cognitive control topics and it serves as an excellent resource for graduate and undergraduate students on these topics." 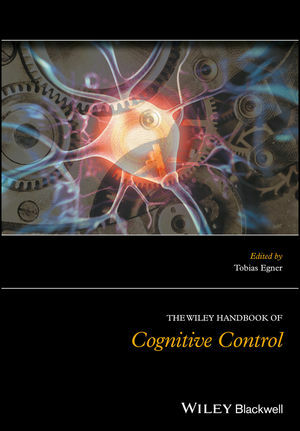 "The Wiley Handbook of Cognitive Control is a collection of state-of-the-field reviews by top researchers. It is a must-read for anyone interested in cognitive control." "This is a fantastic volume that includes an all-star team of contributors. What’s so exciting is to see how cognitive control is now situated in a broader context that includes emotion and motivation, among several other processes." —Luiz Pessoa, Professor of Psychology and Director of the Maryland Neuroimaging Center, University of Maryland, College Park, and author of "The Cognitive-Emotional Brain"
"Finally — a reference text that covers it all in terms of theory and research on cognitive control, with comprehensive treatment from a wide variety of perspectives. This will be essential reading for students and researchers wanting to get up to speed on the current state of the field." "The study of cognitive control lies at the crossroads of understanding what makes us human, and what it will take to make artificial agents that can match the remarkable flexibility of human behavior. It is becoming increasingly central to a wide range of disciplines, from psychology and neuroscience, to psychiatry, artificial intelligence, economics, education, policy making and even philosophy. This is the first volume to systematically review modern research in this area, and is a must-read for anyone interested in entering the area, or making use of the remarkable advances that are being made within it."